•	What are Ireland’s main areas of comparative advantage? •	Where and how can we innovate and improve? Should there be a shift in spending towards product development? Funding from the public via schemes such as that for Oak Glen, based on sponsorship of GPS referenced trees and certificates of sponsorship. A linear ‘arborway’ along the Grand or Royal canals. Planting to achieve New England like autumn colours along motorways. Street trees training programme for Tidy Towns Groups. 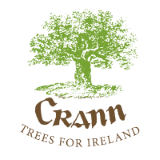 A ‘Trees for All’ Tidy Towns programme, using the successful Shankill [Co Dublin] model developed by Crann, in which a town or village plants under expert guidance the equivalent number of appropriate trees to equal the population of that town. One or more groves of Giant Redwoods – previously native to Ireland.